A crisp shell, surrounding a soft chocolate orange centre. Sugar, Palm Fat (Emulsifiers (Sorbitan tristearate, Soy Lecithin)), Wheat Flour, Cocoa, Whey Powder (Milk), Thickener, (Acid treated Starch from Corn), Emulsifier (Soy Lecithin), Flavours, Colours (Titanium Dioxide, Carminic acid, Beta Carotene), Salt, Glazing Agents (Camauba wax, Beeswax). 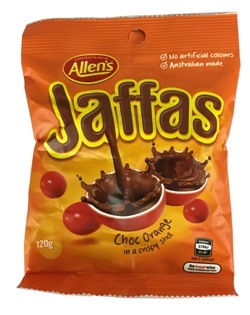 Large balls of chocolate wrapped in a crisp, orange-flavoured shell. Absolutely delicious, and a very satisfying mouthful of chocolate.